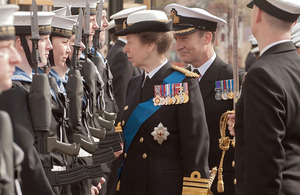 Her Royal Highness The Princess Royal visited Fareham recently for a special Freedom March by HMS Collingwood personnel. As ‘Freemen of the Borough’, HMS Collingwood personnel exercised their right to march through the town with ‘bayonets fixed and flags flying’, led by the Band of Her Majesty’s Royal Marines Collingwood. It was a great honour to welcome the Princess Royal to Fareham on this occasion to mark the Queen’s Diamond Jubilee. I was delighted that many residents visited the town centre to give her a big cheer when she arrived. HMS Collingwood was greatly honoured to be granted the Freedom of the Borough of Fareham on 2 July 1974 - an honour for which we are extremely proud. Officers and ratings first exercised their right to march through the town in April 1975 and, each time since, the establishment has been privileged to acknowledge our unique liaison with the local community. The Armed Forces are particularly grateful for the upsurge in support brought about by the continued presence of our people on operations, including the very significant contribution made by the Royal Navy and Royal Marines in Afghanistan, off Libya and elsewhere around the world. It is therefore a huge honour for members of the Royal Navy to mark our special relationship with Fareham with bayonets fixed and flags flying during such a special year in which we celebrate Her Majesty The Queen’s Diamond Jubilee and the nation’s hosting of the Olympic Games. Also, while in Fareham, the Princess Royal officially opened the newly-upgraded West Street Play Area to commemorate the Queen’s Diamond Jubilee.